If you’re following the Pylon on Twitter (and if you’re not, you should be) you saw us put something out yesterday about an intersection of two of our favorite things: Ball State University and random knowledge. 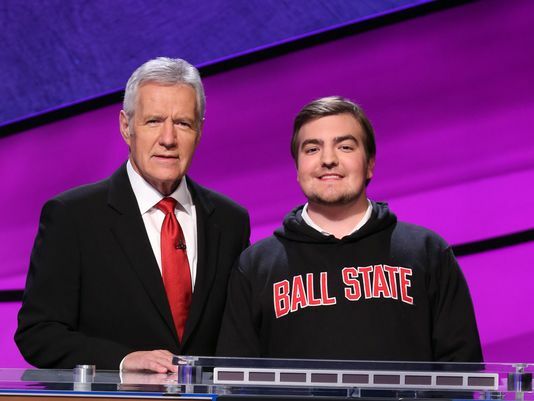 On Friday, Ball State senior Alex Sventeckis will be in the Jeopardy College Tournament against someone from Ohio State and someone from Middlebury College creating what I like to call “Must See Television” in my household. When I was living in DC, I tried out for Jeopardy, and let me tell you: It’s hard. You have to sit in a lecture hall with one of those crummy raise-from-the-side-desktops that are always wobbly and not at all accommodating for a man of any substantive girth for starters and it only gets worse from there. From there, assuming you didn’t bomb the quiz while your internal organs played a nice little game of twister thanks to the desk, you get a “screen test” where you do a fake game to (I would presume) ensure you are capable of being on camera without sweating through your collar (I did) or screaming out inappropriate things when nervous (I didn’t, surprisingly enough). There’s also an interview, but seeing as how I can only assume I came across as a mix of Tommy Boy in his little coat and Ricky Bobby during his first interview, I didn’t get to that stage. But I digress… Alex did. And he’s representing you, me, and everyone associated with BSU. His dream category? Fraternities. Go on…. Step 10: Cry yourself to sleep. Alone. Like always. So be sure to check your local listings for when Jeopardy airs, choose your strategy wisely, and watch your plan come to fruition. You’re welcome.